HCPÂ®30 (Human Colonizing Probiotic, 30 Billion Cells) is a Full Spectrum Probiotic supplement featuring 6 human strains that implant healthy flora throughout the entire digestive tract. It provides all the health promoting benefits of the original HCPÂ®70 High Potency Probiotic, but at a more modest dosage making it more ideal for continuous ongoing use. 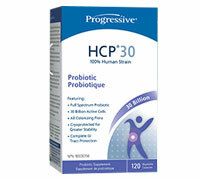 HCPÂ®30 ProbioticÂ is manufactured using a cryoprotective process that ensures the viability of the flora. This coldÂ temperature process removes all the available moisture and microencapsulates the strains for optimum stability. It isÂ further enhanced by the addition of a family of stabilizing support nutrients that contribute to the longevity of the activeÂ cells. Magnesium Stearate (plant source) – a natural lubricant that reduces the creation of heat during the encapsulationÂ process which would otherwise damage the sensitive micro flora. Vegetable Capsules – have a lower water activity level than standard gelatin capsules helping to maintain a moisture freeÂ environment. While the above measures have a profound impact on the lifespan of the microflora allowing it to withstandÂ room temperature for prolonged periods of time, we still recommend that you refrigerate HCPÂ®30 Probiotic wheneverÂ possible. Some debate exists on whether enteric coating a probiotic supplement will reduce the amount of gastric damageÂ following ingestion. Fermented foods have been acting as our primary source of dietary probiotics for centuries withoutÂ being enteric coated. As well, enteric coatings typically use a polymer of acrylic acid (a synthetic chemical) whichÂ conflicts with HCPÂ®30 Probiotic's all natural approach. During a meal our stomach pH increases and becomes moreÂ alkaline (between pH3 and pH4.5). The strains in HCPÂ®30 Probiotic are acid tolerant and can be exposed to a gastricÂ solution in this range without suffering any bacterial loss, eliminating the need for enteric coating. We simply encourageÂ you to take HCPÂ®30 Probiotic with food.